Can I Eat Before a C-Section? Preparing yourself mentally and physically for your scheduled C-section by talking to your doctor and touring the maternity ward can help make your baby’s birth go more smoothly. 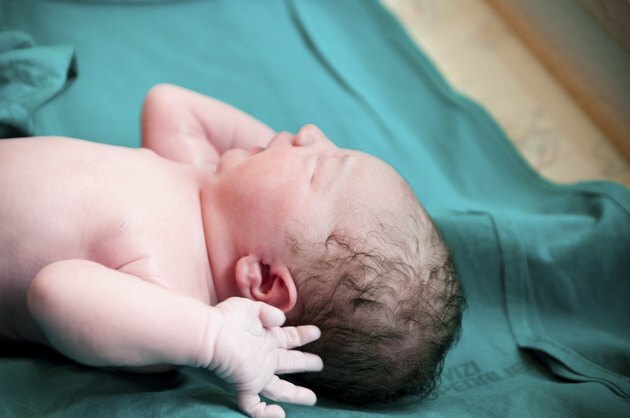 Discussing the C-section procedure before you deliver can help alleviate many of your concerns and let you know what to expect on delivery day. Since hospital policies differ on the consumption of solid foods and liquids before surgery, it is important to ask your primary care provider for guidance on eating or drinking before your C-section. Doctors traditionally banned foods and drinks before surgery -- and even during the labor process of women undergoing uncomplicated vaginal births -- due to concerns that food in the digestive tract might be aspirated, or inhaled, into the lungs or trachea during general anesthesia. Women once had to undergo general anesthesia for even planned C-sections, but today you can usually choose to deliver awake using a regional anesthesia, such as an epidural or spinal block that numbs you from the waist down. The American College of Obstetricians and Gynecologists, or ACOG, provides reassurance that aspiration occurs very rarely in laboring women today due to improvements in obstetrics anesthesia, but it is important to respect your hospital and care provider’s policies on eating and drinking before labor. ACOG recommends that women undergoing a planned C-section not eat solid foods six to eight hours prior to the procedure, but they suggest that most women can drink moderate amounts of clear liquids, including water, fruit juice, clear tea, black coffee, sports drinks and carbonated beverages up to two hours before receiving anesthesia. Not all hospitals or care providers follow these recommendations, so check with yours two to three days beforehand so that you can follow their guidelines. When choosing foods for the last meal prior to your C-section, avoid feasting on heavy or greasy foods. In an article on the Parenting website, Maureen Connolly, the coauthor of “The Essential C-Section Guide,” urges women to eat lightly in the 12 hours preceding their C-section. Connolly cautions that the intestines will slow down in the days after surgery, which can make it hard for food and liquid to pass through your system. Your body can digest a diet consisting of clear liquids and soups much easier than one full of burgers, fries, pizza and tacos. ACOG cautions that pregnant women with a higher risk for aspiration, including morbidly obese women and women with diabetes, might need to follow additional restrictions on food and fluid intake before delivery. If you fall into one of these categories, discuss your condition with your care provider so that he can make appropriate eating and drinking recommendations for your situation. Knowing your hospital and care provider’s policies on food and beverages before your C-section date can help you avoid unpleasant surprises on delivery day. Some hospitals, like the California Pacific Medical Center, routinely ban all foods and beverages, including hard candies, coffee, water and chewing gum, for eight to 12 hours prior to a scheduled C-section. Eating and drinking without your care provider’s express approval can sometimes lead to a postponement of your C-section. If you do choose to eat or drink something against your care provider’s recommendations, make sure you tell your doctor before the surgery. Can You Eat Before an Epidural? Can You Eat Before Labor Induction? What Foods Can Induce Labor?